Over the past couple of weeks, the media have been full of lurid scare stories about what will happen if the UK leaves the EU on WTO terms. One report was that “No deal will hike food bills by 12%”. Apparently, ‘senior executives from the big four supermarkets’ had claimed that with a ‘no deal’ Brexit ‘the biggest tariffs on imports from the EU could include cheese, up by 44%, beef, up by 40%, and chicken, up 22%’. I shall call this “the tariff delusion:” that when we leave the EU, WTO rules will require the UK to keep the EU’s current tariffs and impose them on imports from the EU, as well from the rest of the world. That delusion is simply not true. The UK will adopt the EU’s current tariff schedules at the WTO, but these specify the maximum level of tariffs. We will be fully free to charge lower tariffs or zero tariffs, if we feel fit; but whatever tariffs we decide to charge must be applied equally to imports from the EU and the rest of the world under the “Most Favoured Nation” (MFN) principle. The EEC’s customs union was designed and built before we joined the EEC in 1973. The tariffs were set in order to protect continental producer interests, notably French farmers, German car makers, and Italian clothing and footwear manufacturers. Those were – and still are – the areas where the EU’s external tariffs are very high. 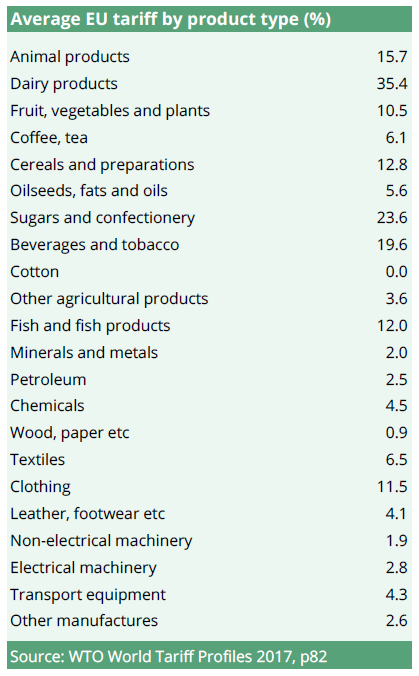 Our consumers pay 100% of the elevated prices for food and clothing inside the EU’s tariff walls, but only part of the higher prices is collected by British producers. When we applied to join the EEC in 1972, part of the price of membership was to swallow the bitter pill of higher food prices. Edward Heath’s White Paper advocating EEC entry in 1971 estimated that “membership will affect food prices gradually over a period of about six years with an increase of about 2.5 per cent each year in retail prices” (para 88 on p.23). And yet we have doomsayers today claiming that leaving the EU will result in food prices going up. By what mad process of logic can it be right that joining in 1973 resulted in food prices going up, and leaving in 2019 will result in food prices going up yet again to even higher levels? The EU’s tariffs mean that UK consumers pay a subsidy to producers in other EU countries. This is particularly easy to understand with goods which are not made or grown in the UK. The tariff on oranges was increased to 16% in October 2016. There is no production of oranges in the UK and therefore no domestic industry to protect. The British consumer can buy Spanish oranges tariff-free, but must pay 16% tariffs on oranges imported from the rest of the world. The effect is that UK consumers have to pay 16% more for their oranges than if oranges were let into the UK at world prices, and Spanish and other EU orange growers can raise their prices to match world prices plus 16% on top. In addition to tariffs raising prices inside the EU above world levels, the rules of the EU Single Market on goods create so-called “non-tariff barriers” (NTBs) against imports of many kinds of goods from outside the EU. Economists have estimated that the combined effect of the EU’s tariff and non-tariff barriers is to raise food and manufactured goods prices inside the EU 20% above world prices. Since we have a huge deficit of £95bn in our goods trade with the EU27, UK consumers pay £16bn per year over and above world prices to EU27 producers. We can cut both kinds of barriers on imports from outside the EU on the day we leave the EU without a withdrawal agreement. By contrast, under the Chequers plan, we could not reduce any tariffs on non-EU imports until the so-called “Facilitated Customs Arrangement” can be made to work (which seems to be either 2022 if you are really optimistic, or never), and we would be permanently locked in to the EU’s non-tariff barriers against goods imports from non-EU countries. After Brexit, the UK will not have to charge any tariffs on anything unless we want to. This is what we should do. No purpose is served by these tariffs. We should get rid of the 16% tariff on oranges and other foods that we do not produce, as well as tariffs on textiles and clothing where there is no significant UK production. This would give an immediate ‘Brexit dividend’ to lower-income families, without harming any producer interest. Take beef, which the scare story I began with singled out as subject to 40% tariffs on leaving the EU without a deal. Beef farmers in the UK have a legitimate interest in not suddenly being subject to a sharp price fall which could happen if tariffs were to be scrapped overnight; but equally consumers have a legitimate interest in not having prices go up. The answer is to set a new lower UK tariff applied equally to beef imports from both the EU27 and the rest of the world, in order to maintain the price of beef in the UK domestic market at its current level. Some industries with highly-integrated supply chains could suffer if tariffs were imposed between us and the EU. We cannot stop the EU imposing tariffs on inward-moving goods, but the UK is not obliged to nor should it levy tariffs on components coming in the opposite direction. For example, the UK should zeroize tariffs on car components. Under WTO rules, the tariffs would be made zero on components from the EU and also at the same time on components from the rest of the world. This would prevent car manufacturers having to pay unnecessary tariffs on components imported into the UK and assembled into a car here. Where existing supply chains involve acquiring components or sub-assemblies (such a gearboxes or engines) from within the EU27, a zero tariff policy on imports of components into the UK would avoid hitting car manufacturers with UK import tariffs, and would also allow them to source components from the rest of the world more cheaply than at present. Far from damaging the car industry in the UK, such a scenario would boost its competitiveness. We should scrap existing low-level tariffs on all kinds of goods. It is hard to see the purpose of tariffs which are below 5% or so, when foreign exchange rate has moved 15% or so in favour of UK industry over the past 18 months. Getting rid of low-level tariffs on a wide range of goods will cut costs to businesses, and reduce the administrative burden on customs of dealing with imports from the EU27 on top of imports from the rest of the world. Much of the hysteria about ‘shortages’ of goods such as food and medicine seems to be based on the idea that the UK would impose non-tariff barriers against the importation of goods from the EU27. Not only would such an action be criminal stupidity, but it would require a positive amendment to the law to achieve it. The European Union (Withdrawal) Act 2018 ‘repatriates’ into UK law the corpus of existing EU laws. This includes laws which provide for example that it is lawful to import medicines made in a factory in Germany under the supervision of German authorities. So there will be no legal barrier against the continued importation into the UK after 29th March 2019 of goods made and certified under EU standards and rules, unless we were stupidly to create them. EU law has successfully reduced NTBs on goods flowing between EU member states, but it has required us to impose unjustified barriers on imports from the rest of the world. It would be illogical to discriminate between goods from the EU27 and goods from the rest of the world once we leave. But instead of putting up barriers to imports from the EU, we should extend to the rest of the world the present EU rules which require imports to be allowed when there is no objective justification for excluding them. This would bring huge benefits to UK consumers. We should relax the present EU-imposed rules on intellectual property which allow multinational brand owners to force up prices of branded goods here by keeping out their own genuine goods which they sell in the rest of the world at lower prices. Tesco could then import and sell genuine Levi jeans from the USA – which it was stopped from doing by a case in the ECJ brought by Levi Strauss. Once we leave, trade agreements will produce additional benefits. But it often seems to be assumed that the benefits of an independent UK trade policy only come when we conclude trade agreements. This is just not true, since all the measures outlined above to gain the benefits of reduced barriers to imports can be reaped by unilateral action at once on 30th March 2019. Please find the original version of this article here.